﻿ What Really Inspires Owners to Start Their Business? » Red Mango Marketing! 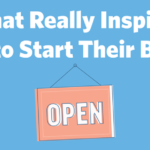 What Really Inspires Owners to Start Their Business? If you’re a small business owner, you’re motivated by something unique. A reason you get out of bed in the morning and put in the long hours. Something that drives you to roll up your sleeves and get the job done. As part of National Small Business Week, we want to know what drives you. Maybe you run a small business because it allows you to pursue your passion, as 62 percent of businesses surveyed reported. Maybe you’re motivated by the freedom to control your professional life, and the flexibility that brings. See what drives other small business owners — check out the infographic below! Looking to grow your small business? Try out a free 60-day trial of Constant Contact’s email marketing. The post What Really Inspires Owners to Start Their Business? appeared first on Constant Contact Blogs. This entry was posted on Monday, May 1st, 2017 at 8:00 am	and is filed under Business Tips, Fresh Insights, News & Updates, Small Business. You can follow any responses to this entry through the RSS 2.0 feed. Both comments and pings are currently closed.